On April 13th and 14th 2015 Akebono held its annual Supply Partner Meeting. This two day event is a chance for Akebono to review with its key suppliers may significant business items that affected their business in 2014. Items such as sales review for 2014 and sales forecast for 2015, supplier quality performance, production control and logistic policies and procurement policy are reviewed with the supply base. 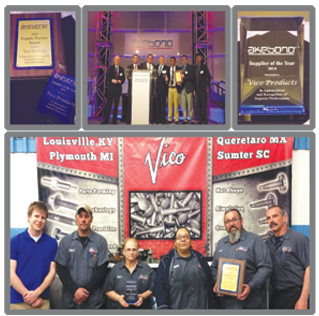 The highlight of the conference is the supplier awards & this year was extremely special for Vico. First, the Plymouth facility was recognized with the “Supply Partner Award”. To qualify for this recognition your company must have both a “0” PPM and SCR score, have shown cost savings via VA/VE ideas and APR and achieved 100% on time delivery. The meeting closes with the much coveted “Supplier of the Year” award. It was with great pleasure we learned that Vico was the 2014 recipient of this award. In doing so we have distinguished ourselves among our peers and gone above and beyond to support Akebono’s mission. The honors where celebrated in both Plymouth and Louisville with a luncheon for all our associates. Well done Vico!